The Oxford Thinking Campaign is the biggest and most ambitious fundraising campaign for higher education in Europe. With a target of £3 billion, money raised through the campaign supports vital work across the University and colleges. Watch our short animation to find out more. 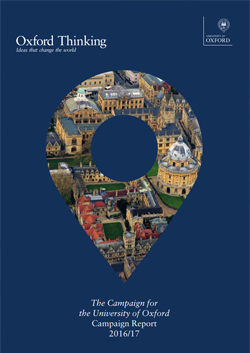 The Oxford Thinking Campaign Report provides an annual snapshot of some of the incredible work being undertaken at Oxford as a direct result of philanthropy.